I am now offering Fine Art Prints for purchase on my web site. I was encouraged to offer prints from many reader of my blog and I am delighted to do so. 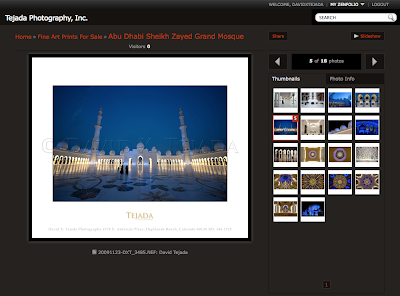 I use Mpix for my fulfillment, photos are printed on E-Surface Premium Matte Finish paper with over 100 years of archival life. I have several galleries of images to select from, new images added monthly. I hope you take the time to look at my images for sale and perhaps include some of my work in your art collection. 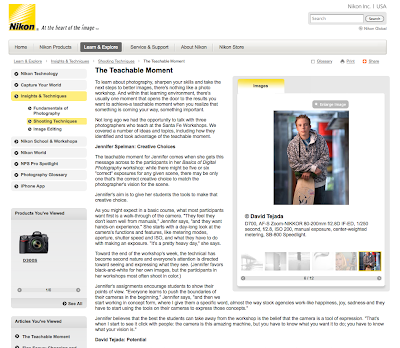 I'll be speaking at the Shores Camera Club on June 9, 2011. I'm delighted to be speaking to such a dedicated group of photo enthusiasts . The Shores Camera Club holds it's meeting at the Daytona Beach Shores Community Center, located at 3048 South Atlantic Ave. (A1A), Daytona Beach Shores, Florida. 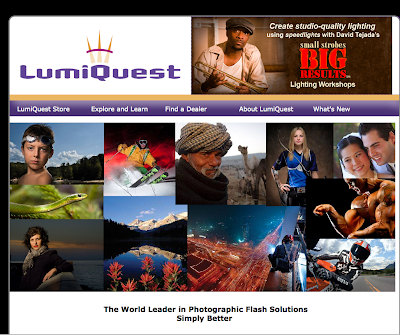 I want to thank LumiQuest for their continued support of my Small Strobes, Big Results workshops. They have provide products for my use as well for students attending my workshops and I am very grateful for that support. 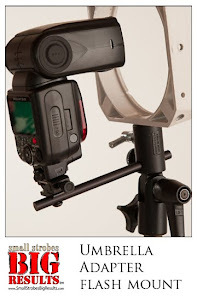 Not only are their product well made, properly used, they can produce some outstanding light. 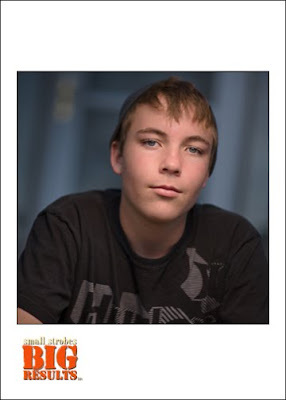 One of my favorite new products is the SoftBox LTp. I made this portrait of my son Chris on the front porch several months ago. The SoftBox LTp is design to fit any computer laptop pocket in your camera case. I know I can produce quality light like that shown above in an instant. My London workshop last year was held at the Park Plaza Hotel, just over the Westminster Bridge across from Big Ben. We rented a penthouse suite on the 15th floor to photography in, it was furnished in a clean contemporary style. When I create photos, I try very hard to tell some sort of story. Doing so, helps define your choice of lighting and the overall mood of the image. The image above was shot in the master bedroom of the suite. I wanted to create a photo of this young lady getting ready for an evening out on the town. 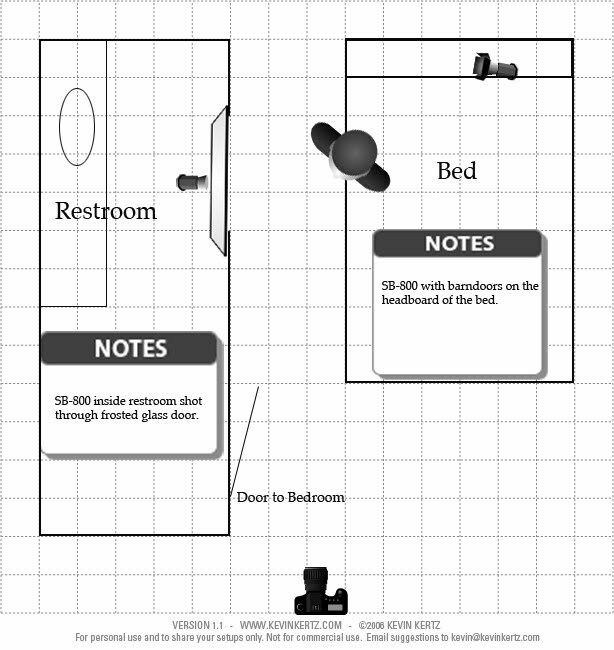 Directly in front of the model seated on the bed is a frosted glass door which leads into the bathroom. When I see frosted glass, I think super soft light. I placed an SB-800 behind the door for the key light. This light was gelled with a full CTO, which means that my white balance on my camera was set to...... you guessed it. Tungsten. I decided to shoot with this white balance because I had a small amount of daylight coming in through a window camera right of the model. I wanted to invoke a evening feeling to the scene. I also placed an SB-800 on a Justin Clamp on the headboard of the bed, this strobe was fitted with a barndoor. That light was not gelled so it was daylight balanced and therefore, cool in color temp. because of my white balance on my camera. 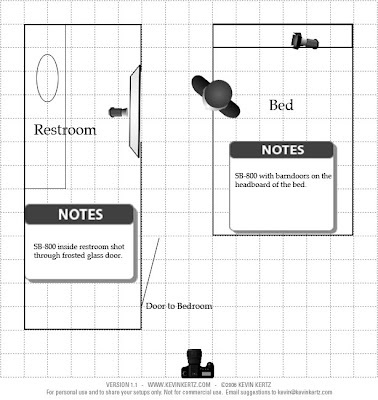 Here is a diagram to help show you how it was set up. My camera position was outside of the bedroom down the hallway. Using a longer lens, I was able to include the bedroom door which added an interesting reflection on the left side of the image. 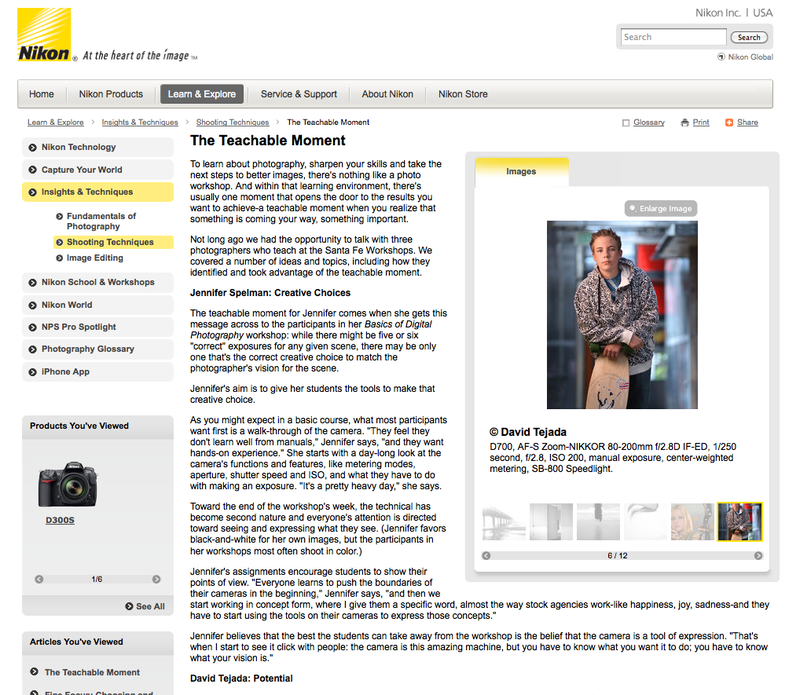 This morning, Nikon has posted an interview that I participated in which is about The Teachable Moment. Jennifer Spelman, and Arthur Meyerson were also interviewed for the article. Jennifer speaks to the Creative Choices we make as photographers, I discuss the Potential of the image and Arthur address Solutions to the image process. Have yourself a look, you may enjoy reading the article. As you may know, I teach my Small Strobes, Big Results workshop a couple of workshops a year at The Santa Fe Photographic Workshops. I'll be teaching my workshop this coming June 19th - 25th. There are a few spaces remaining, if your interested in learning how to achieve studio quality light on location using speedlights, this workshop is for you. For more information about the workshop and registration click HERE. I've been busy shooting a lot of corporate portraits recently. A few weeks back I was shooting for a high tech company in Boulder, Colorado. I shot several head shots in a small conference room, similar to the video I have posted at YouTube. Aside from the head shots, I was ask to create a special portrait of the CEO. The company I was shooting for is in the business of developing innovative microRNA to treat cardiovascular and muscle diseases. 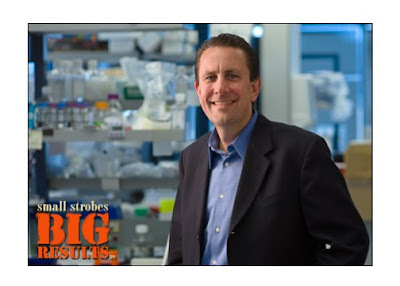 I felt a portrait of the CEO in one of their high tech labs was fitting for the boss. 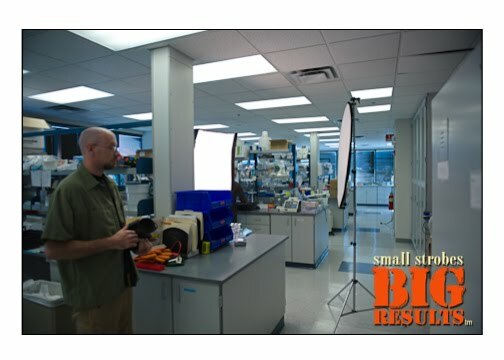 I scouted several labs on their premises and selected one which gave me a good depth to work with. I wanted the background to go soft, so I needed a bit more length in the room to do so. The lighting was quite simple, I had windows in the back of the room which I was able to turn cool by using a white balance of tungsten on my camera. Doing so, meant that I had to turn my key light into a tungsten flash. My main light was a 30" X 30" FourSquare with a single SB-800 gelled with a full cut CTO. Here is a set up shot for your reference. You will also notice that I placed a reflector on a stand to bounce some additional light on the shadow side of my subjects face.